Six months pregnant, abandoned and without a penny to her name, Lily Hansen has only one place to go. The ranching community-and her traditional father-won't take kindly to her situation. 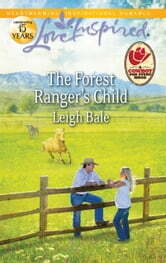 But when a handsome forest ranger saves Lily from a flash flood, all she sees is concern in his warm brown eyes. She soon discovers that Nate Coates's own harrowing family history is behind his need to take care of her. Though she dreams of marriage, she'll have to open her heart to love before she can become Nate's wife.